Let this exquisite composition of beautiful blossoms deliver your sympathy and comfort loved ones grieving a loss. 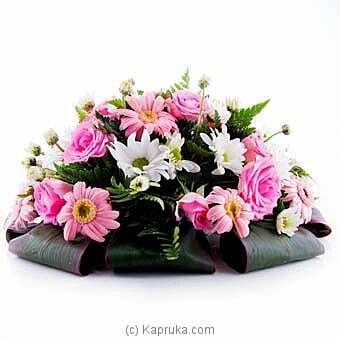 The elegance of this arrangement makes it an appropriate addition to any wake, funeral or graveside service, or to send to the home of family or friend. This arrangement has made with 12 Gerberas and 15 pink roses. Siddhalepa Ayurveda Head & B..